Editorial Note: It came to our attention that the underlying data used for our 2017 Annual Update of new power generation were incomplete for both the year’s final quarter and year-end results. Utility-scale gas, wind, and solar generation as originally reported did not include data from the month of December 2017, which combined totaled just over 4900 megawatts of power. This impacted not just the results presented in that earlier post, but also comparisons made to the 2017 results in our following quarterly update analysis. Please note the updates in the post (strikethroughs indicate in-text corrections) and new charts below, where we have corrected our error. As new power generation comes online, investments in renewable technologies consistently outpace those in fossil fuel development. Continued growth in both distributed and utility-scale solar has further solidified this trend in recent months. In fact, for the last year, distributed generation — or electricity produced locally from rooftop solar on homes and businesses or in nearby community solar gardens — has averaged a share of 18.5% more than 20 percent or close to one-fifth of all new power generation. As noted above, we have updated the following charts to correct an error made in our original reporting of new power generation from 2017 Q4. Editorial Note: This chart was updated July 2018, correcting an earlier error in reported 2017 data. So far this year, renewable energy from both solar and wind energy accounted for close to 3.4 gigawatts (GW-AC) of all new power generation, claiming well over three-quarters of the total 4.1 GW capacity added nationally. New natural gas plants, continuing to grow at a slower pace which picked up slightly since the end of 2017, still account for less than one-fifth of the country’s new power and pale in comparison to the amount of renewables (82%) added so far in 2018. Natural gas—the only fossil fuel capacity being added to the grid at all—has accounted for less than half of new capacity in all but two of the last nine quarters. 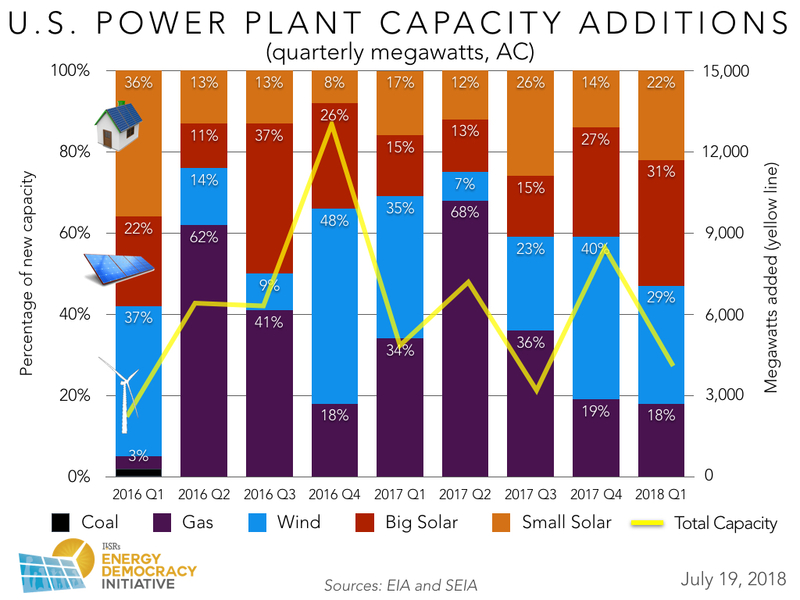 Notably, new solar from both small-scale distributed and utility-scale generation outpaced wind development for the fourth consecutive quarter in a row, with 65% of total renewable generation and 53% of total power plant capacity added to-date this year. 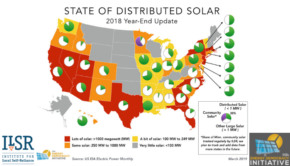 Distributed solar added a solid 910 megawatts (MW) of new capacity in early 2018, corresponding to its best first quarter performance to-date and not too far behind a record-breaking final quarter of 2017, where more than 1200 MW of small-scale solar came online. With the addition of these latest results, distributed generation has averaged almost more than one-fifth (18.5% 23.5, to be exact) of all new power generation over the last four quarters — not too far behind a slightly higher average share, in fact, than shares of new wind (24.8% 23.3) or big, utility-scale solar (21%) averaged over the same time period. This consistent, steady growth of distributed generation is a positive sign for communities, considering the benefits such power sources bring to the local economy. New residential rooftop solar requirements in California, successful community solar programs in states like Minnesotaand Maryland that could inspire other states to follow suit, and decreasing costs of battery storage that make solar even more economical, are all signs that point to the myriad of ways distributed solar has become more accessible for individuals, businesses, and communities alike. In light of a new tariff on imported solar arrays that took effect earlier this year, it will be interesting to see whether the distributed solar market can continue to claim a growing share of new power generation in the months and years ahead. Of course, if the steady growth of new distributed generation over the last year is a bellwether of what is to come, it does appear that the rooftop revolution has arrived and is here to stay. Interested in earlier trends and analysis? Check out our archive, illustrating how new power generation has evolved in previous quarters and years.